This waterfront villa would be great for a few couples or a large family. There’s two queen suites upstairs and two twin suites downstairs, so adults can relax in solitude while the kids play in the pool and watch TV. There’s also a guest cottage for teens or nannies, which gives everyone their own space. Waterfront villa within minutes to Blowing Point Beach! Water’s Edge is an oceanfront, five-bedroom villa just 600 feet from Blowing Point Beach. 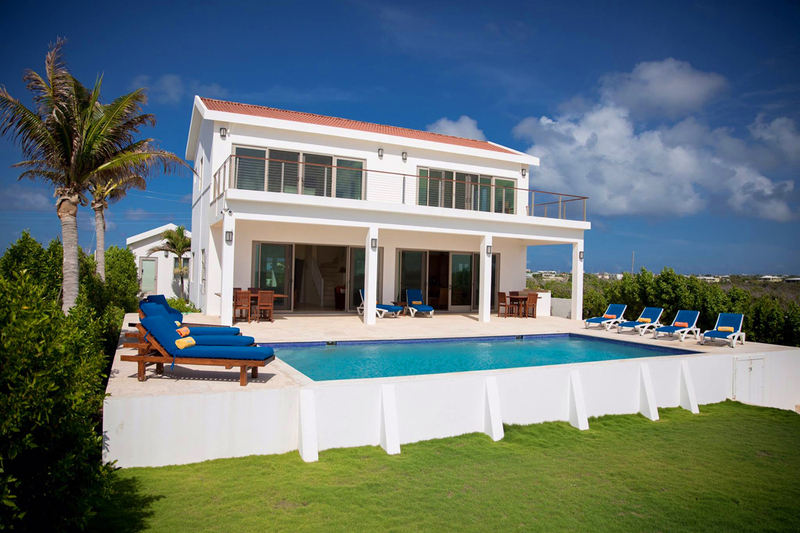 This villa is ideal for couples and families alike, and is near Anguilla’s ferry and restaurants. The turquoise lap pool is surrounded by a small lawn and a deck with loungers. Sliding glass doors lead into the common area, which incorporates the living room, kitchen, and dining table. The living room features a flatscreen TV, ceiling fan, and cushioned seating. Standard appliances and a breakfast bar outfit the kitchen, and the dining table seats 6. A Sonos sound system and WiFi run throughout the house, and security cameras provide peace of mind. All five bedrooms feature air-conditioning and a Smart TV, including the guest cottage suite. In the main house, there are two identical master suites upstairs and two twin suites downstairs. The master suites each have their own terraces, ensuite bathrooms, and queen beds. The twin suites can be combined and used as a family room, or kept separate. One of these suites has an ensuite bathroom and exterior access only. The detached studio apartment has two twin beds, an ensuite bathroom, and a kitchenette. Daily housekeeping maintains the villa. The majority of Anguilla’s restaurants, attractions, and public beaches are to the west of Water’s Edge. Bedroom 4 - Hibiscus: Lower Level - This bedroom can be used as a family room with bedroom 3, or can be used separately. If this bedroom is used separately access to the room would be through the exterior sliding door only. pool size 30 ft. x 15 ft. Blowing Point Beach is approximatley 600+ feet from Water's Edge villa. Upon arrival guests will secure a taxi or rental car and drive to the villa using the directions provided. Car rental, private chef, butler, server, grocery and beverage shopping (pre-arrival and during your stay), liquor and wine delivery, nanny service, baby equipment, spa services, yoga and personal training, photography, and private transfer/car service can be arranged for an additional fee.